What data or documentation would it require to convince me otherwise? For example, what documentation would I require to be convinced that keyword density doesn’t matter at all? That video doesn’t impact SEO? That social metrics actually do matter? We all need to be able to answer these questions for ourselves if we want to advance our skills and become more data-driven in our marketing approach. Acting in opposition to good data must be an anti-data-driven strategy, right? So, if there is data, and good reason to support a fact that you are refusing to acknowledge, then you must be an anti-data-driven marketer. Sticking to gut feelings, hunches and best practises without proof or evidence is terribly stupid. 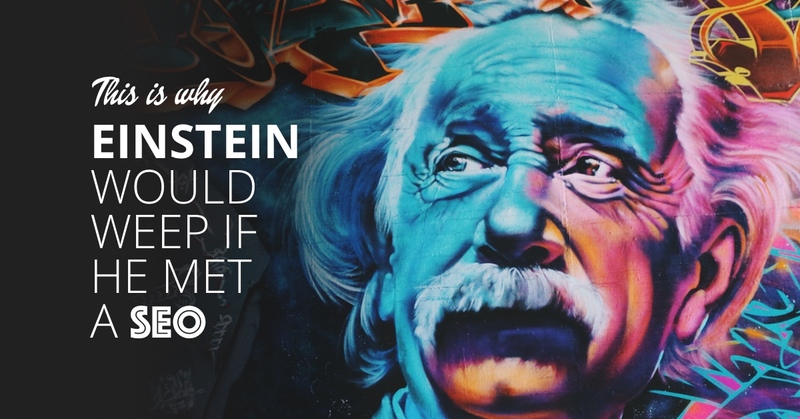 I only recently (past 1-2 years) started fighting the stupidness I had been a part of for years… So-called “SEO experts” throwing optimization tips and ranking factors around like goddamn clowns. Wrong, wrong, wrong, wrong and wrong. SEO Best practises are often plausible tips echoing in our consensus-chamber until we all started believing them and, ultimately, recommending them. Everyone is entitled to an opinion, but if you recommended any of above “facts”, then you need to state clearly that it is an opinion, idea or hunch. Furthermore, underline that you do not have proof, evidence or documentation to support your claim that those actions results in better rankings in Google. Quite the opposite, there is substantial evidence to support the contrary. And don’t get me wrong. There is nothing wrong with unproven tips and tricks as long as you clearly disclaim your recommendation is an unsupported and perhaps even controversial claim. 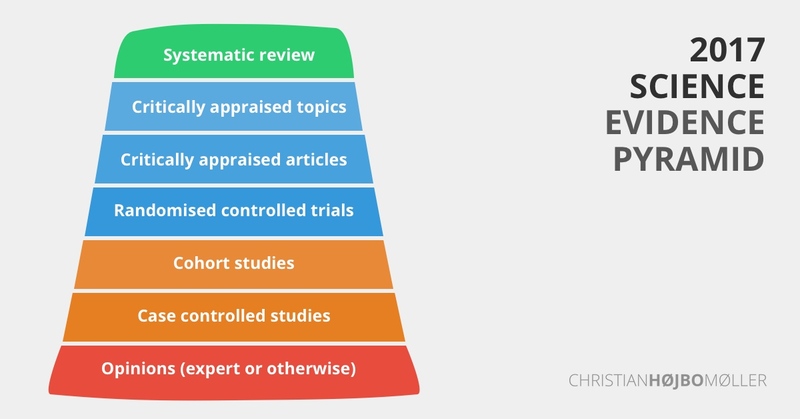 This is an evidence pyramid based on evidence levels in science. It shows different levels of evidence and the trustworthiness based on how it has been scientifically tested. Systematic review being the most trustworthy level of evidence in contrast to opinions. We operate a bit differently in the SEO industry, with good reason. It is difficult to perform well controlled experiments in SEO and even harder getting experiments like that funded. We, naturally, need to trust less proven stuff than biological scientists should, given the secrecy of the google algorithms. However, we should not settle for poorly documented optimizations. Many best practises still work, but their effect is not nearly what they used to be due to the ever-changing nature of Google’s algorithms. Correlation studies have historically been the greatest way for us to get reasonable good data insights from actual real-life cases – controlled correlations. 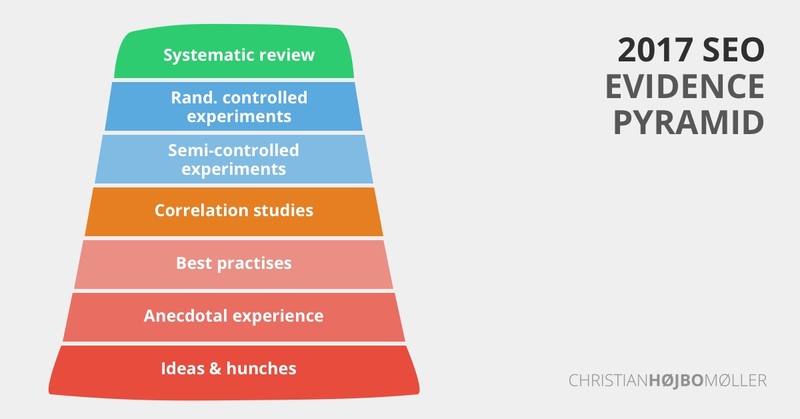 However, randomised controlled experiments and systematic reviews are a ridiculously rare thing in online marketing. I’d like to do my part. Therefore, I have performed some randomised controlled experiments by SEO split testing SEO-actions on platforms and portals. You will soon be able to read my studies about how to improve for example CTR in SERP. Furthermore, I have done the (ridiculous tough!) groundwork to publish the biggest Danish correlation study ever. How do we improve as an industry? We begin by asking better questions, shaping them into testable hypotheses and subjecting them to rigorous trial. This is the data-driven (evidence based) way. Don’t get me wrong. I actually believe that most agencies and specialists help their clients get more visibility, traffic and business from Google. However, even though I was the youngest person to win the Danish SEO award and the youngest Senior Consultant in GroupM EMEA history, I have no trouble accepting the fact that SEOs (myself included) know little about how Google really works. We need to accept that fact before we can sit at the grown-up SEO table and have grown-up discussions. But if even the specialists are clueless then why should we hire a SEO specialist? There is a big, big difference between an experienced and talented SEO specialist and the regular SEO manager you’ll find in any ecommerce organization. Great experts are, in my opinion, worth the money, but that doesn’t justify lying to get business, to get famous or to seem more knowledgeable than the more honest specialists. Some things work well and we have evidence to support it (green). We also know that some stuff simply doesn’t have a big impact (blue). Then there are actions that work without us knowing (red). Lastly there are things we don’t know about that have no effect (orange). By far, most of the actions SEOs recommend companies and organization are in the blue and orange box. Not because they are bad SEOs but because most actions have small accumulative effects. 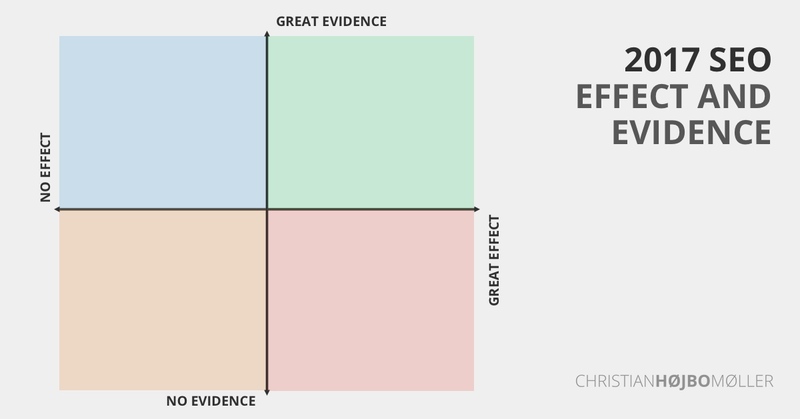 A minority of the actions might fall in the green area, but the vast majority will be low-effect actions with scarce evidence to document actually work. I don’t mind that. My problem is people selling green box actions when the actions they recommend actually belong in the orange box. We need to be clear on the level of evidence – and be clear when we are speculating or have personal anecdotal experience that might prove useful. We live in an SEO industry full of myths, proven recommendations and controversial topics. Combine that with agencies, clients and money and you have yourself an ugly cocktail. To improve trust in this discipline, SEO’s need to stop believing/preaching that they know how Google works, and instead begin speaking more humbly about the effects and the level of evidence certain actions have. I believe this will help us advance more, get better faster, have happier clients and keep bull-shitter SEOs out of the game. 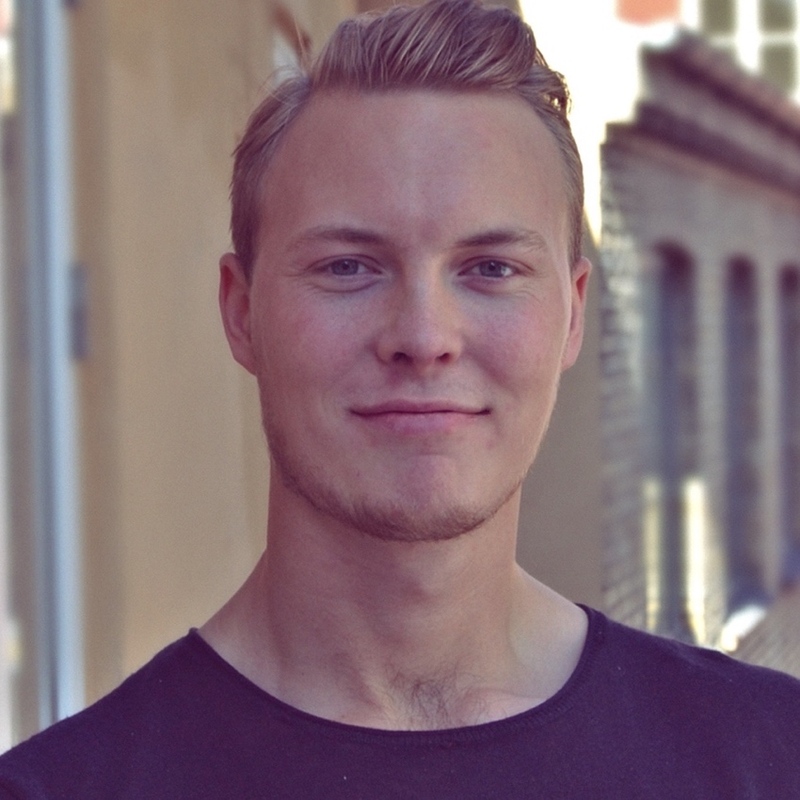 Christian is the CMO and co-founder of Candidlab, which recently expanded to 11 countries. His past includes being Lead- and Senior consultant in the world largest media agency, GroupM, where he worked with clients like HBO, Ford, Just-Eat and Toyota. Connect on LinkedIn, follow on Twitter or send him a text.